The West Bend High Schools are home to three of the funniest students in the state of Wisconsin. East junior Emily Kolb took first place in the category Solo Acting Humorous at the state forensics tournament held April 7 at the University of Wisconsin—Whitewater. Kolb was joined at the podium by West senior Anna Pitz and East junior Ian O’Day, who were also among the six finalists in the category. 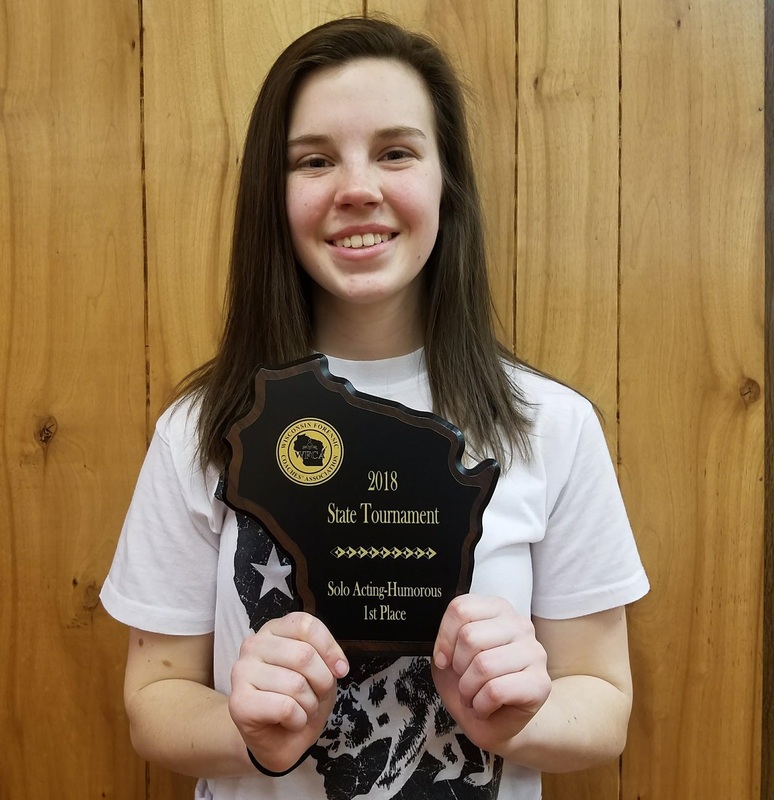 The Wisconsin Forensic Coaches’ Association describes the category as “bringing a humorous text to life through solo performance.” Kolb says she was incredibly surprised when she was revealed as the state champion. Doris Sexton, the East forensics coach, wasn’t shocked by Kolb’s success. Kolb didn’t see that potential until later in the season, however. “After the last tournament, I knew I had a shot to get into semifinals, and whatever happened happened after that,” Kolb said. Pitz, another one of the finalists, shared the same sentiment. Pitz says that being announced as a finalist was a wonderful feeling and the most exciting moment of her high school career so far. Pitz said WBHS’ success in claiming half of the category’s finalists was amazing. Kolb says a key part of her success was being confident. Pitz attributes her success to lots of practice. “I practiced talking to myself in my bedroom a lot before that special day,” Pitz said. Pitz also attributes it to the support she received. East junior Emily Kolb with her state tournament award. Photo by Caitlin Marsch, Current Staff.